Since 2002, iKitesurf has become the world’s most respected and popular weather authority for Kiteboarding. Featuring realtime wind observations from over 50,000 key locations around the world plus exclusive forecasting technology, iKitesurf is a daily visit for serious kiters. WeatherFlow technology and staff of professional meteorologists have powered iKitesurf since the beginning. Over 500 exclusive weather stations. iKitesurf.com and iK mobile app. Forums, Classifieds, Videos, Cams, and more. 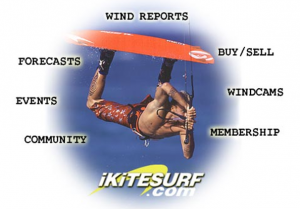 iKitesurf.com is a great example of what WeatherFlow can do for a target niche audience – satisfying its client’s weather needs and more.